More Goals Per Profile – Now 20! 20 Goals instead of just 4 – That’s 500% more Useful and 1,000% Simpler! Some of the reasons that we love using the Google Web Analytics platform (other than it is free to advertisers) is that it provides a nice set of Conversion Metrics and Goal Tracking features. The down side to the goal tracking in GA has always been that you were limited to just 4 Goals per profile. In order to be able to track 5 or more conversions, you use to have to set up additional profiles for the same site and then establish the new working goals in them. This made things a pain due to the additional steps it took to change back and forth between profiles to check your metrics for the same segments and reporting time. The process is much simpler now. Reorder, Resort & Change Goal Position – About Time! 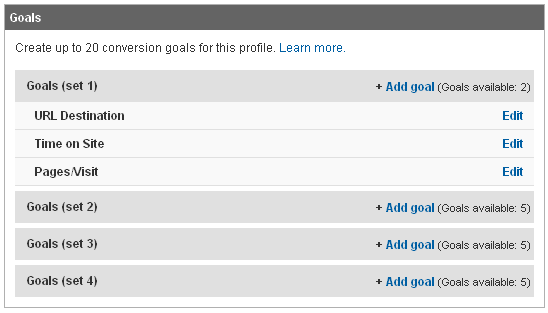 The new “Change Goal Position” feature is a minor one to most, but one that I have been greatly hoping for for quite a few years and am very pleased it has finally arrived. Before this feature arrived we had to manually copy the goal settings from 1 goal to the next and some times from 1 profile to another. This made it a tedious process to rearrange your goals into an order that places your more important goals front and center where you want to see them first. 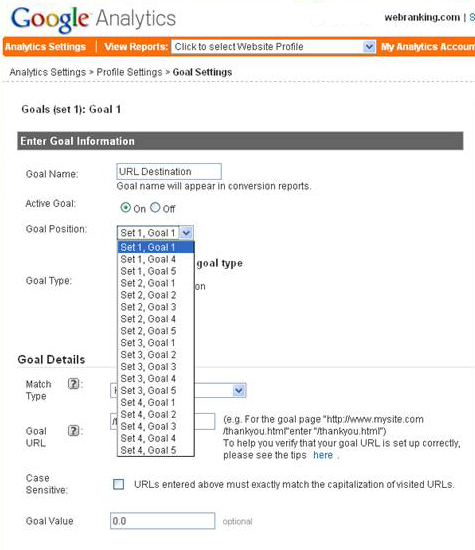 Check out the official Google Analytics Help page on “How do I change my goal’s position?“. Visit the official announcement page to read more and watch a couple additional related videos.